Being a parent is not an easy job, especially when your toddlers suddenly turn into teenagers and start roaming around with Smartphones, iPads, and Laptops. With the advent of smartphones, internet and apps, a lot of things have changed. Exposing your kids to technology is always a good thing, but with the rise of cyber crimes and the vulnerability of valuable information to the internet makes them worried about what their kids. Parents are always concerned about the security and the things their children do on the web these days. To keep a check and monitor on their child’s daily activities, interactions and to protect them from the dark internet, Pumpic is the latest monitoring app for all these issues, and this is the review of this monitoring app and why it is recommended for every parent and guardian? One of the simplest way to keep tabs on your kids and their iOS and Android devices is with the Pumpic Mobile Monitoring App. Pumpic is an upcoming device monitoring platform with a parental overview on most of the activities happening in your child’s life. It is an excellent way to keep your kids safe and secure both offline and online. 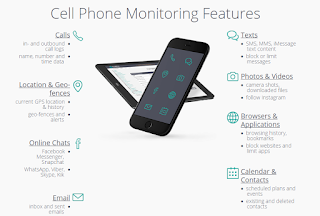 It is a feature-rich app that can monitor smartphone and tablet activities such as messages, chats, GPS location, calls and much more and this service is a parental control tool that helps to keep track of cell phone usage, online activity, and even remote access to the devices. With more than 20 features, Pumpic can ensure full-fledged security for your teenagers. Also, you are capable of monitoring call history, current location, history and specific chat monitoring features for Facebook Messenger, WhatsApp, Skype, Viber, and Kik. The company was founded in 2012 and consists young and enthusiastic tech savvy people. It is an upcoming software development company that is emphasizing to provide user-friendly and efficient monitoring solutions to help people protect their loved ones and children. The very first advice to all the users or parents is that you’ll need to register and purchase the subscription, but the company offers a free 7-day trial period and demo to get a glimpse of all the major features that the monitoring platform offers for the security of your children. The app provides a control panel and gives you an eye of all the internet related activities and the GPS-based location for extra security. You can also view the demo here. So, let’s start with installation and the setting up the account. Step 1: - After registering and the sign-up process, you’ll receive the mail with your account details and the password. Step 2: - Login to your Pumpic Account and then you’ll need to download the app from the store on both the monitoring device and on your kid’s smartphone or tablet. Installing the monitoring app would require the physical access of the targeted device. So, it is better to inform your kid about the app and why are you installing on their phone. Choose the Platform (Android in our Case) and download the app from the Play Store and click next on the Website. Fill up the details and you’ll get a verification code from the site’s control panel. Enter the PIN and, then you have to set an admin’s password for the device. You’re ready to Go! The monitoring will start automatically after some 15-20 minutes. This is the best smartphone app that lets you monitor and overview on your child’s device activity and the amount of usage. You can limit the number of messages and calls that your child does. Moreover, the app gives you the access to block malicious websites and inappropriate content. Further, many other features are also available in the Control Panel on the Pumpic.com. What I loved the Most? Even though the whole platform is incredible and very much helpful for the parents but one of the best things that made it the best monitoring app is the Control Panel. Although, you can also monitor with your smartphone, but the CP on the website is much better. Once you are logged on Pumpic.com, you can track and monitor every activity happening on your child’s phone. Calls, messages, chats on WhatsApp, Real-Time GPS Location, photos, videos and much more. Pumpic’s Control Panel works amazingly fast and has a simple design with a master view on every activity. All in All, it was the best feature. Some features require root access. Major applications work without root. So talking about the price and plans, what does this peace of mind is priced for? 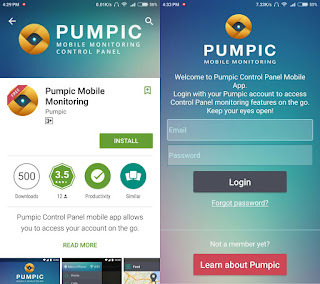 With all the necessary features, Pumpic Mobile Monitoring App’s primary plan is priced at $5.33 per month and for the premium plans, they charge you with $6.99 for a month’s subscription. You can also purchase this virtual guardian on a quarterly and annual basis too. Also, with the annual plans, you get the bonus of support extended up to three devices. All in All, the basic plan is available for $63.99 /annually. You can check more about the plans, pricing and the included features on its official store. I think it’s enough to enlighten you about this fantastic product and a must recommendation for all the parents who are stress out about their children’s security. You can easily purchase the subscription on the official website. Moreover, monitoring apps are a must as the rise in cyber crimes and bullying involves a lot of teenagers. It is always better to get a hold of your child’s security and vulnerability on the Internet. According to a study, 51% of kids are bullied online and don’t inform their parents as they fear of the wrongdoer. So, that was it. I hope that I’ve abetted you much about this monitoring app. It is a premium service and costs $5.33 monthly, for the essential features and works seamlessly on Android & iOS devices. You can also use its 7-days trial period and the demo of the control panel online. Likewise, you can check more on its official website here. Do let us know if you’re interested in the product and tell us about your experience below in the comments.